Yes, there are plenty of challenges when generating a RFP and the objective of this series is on how you can improve your document and how can we make this task easier for you as a Buyer? I wish there was an easy answer, however, with the exception of hiring a third party professional there is no easy way around this. Yes, you can hire someone to create or write your RFP’s! Sign me up right, as I for one am not a big fan of writing them from scratch which is why we started offering our forms to Buyer’s and Supplier’s that have similar sentiments. First, few companies have the desire or the budget to hire third party professionals and second when you outsource it does defeats the purpose of developing your role as a Purchasing Professional. And last, your boss might ask what you were hired for…not good! You can improve your RFP’s simply by improving your skills. Always invest in learning about best practices as they will provide a great rate of return! Enroll in classes specifically designed to assist in developing RFP’s. These can be expensive and often it may require travel which unfortunately does add additional costs…on the positive side, some employers will pay for courses you complete and pass so why not make the ask. Most forward thinking companies believe in investing in an employees professional development. Improving your technique and presentation will come with practice so become a student of your trade. When you issue a RFP, make note of what worked and what did not. Did we include useful information to limit inquiries? Did we get an overload of vendor inquiries and if so on what components of the RFP? Block out time to work on the DRAFT. Avoid taking calls and interruptions. Unless writing RFP’s is all you do for your company, it can be challenging to find opportunities in a busy day to remove yourself from distractions and spend time developing documents so it is not unusual for Buyers to shortcut and or miss something in the process. What we find so onerous about them is ensuring all the bases are covered…commercial terms, the legal piece, environmental, scope and technical just to name a few. Truly, the best way to improve your RFP is to make sure it is not all blah, blah text — ensure your scope and technical sections have enough detail to encourage formal responses from bidders. This will ensure Vendor’s truly understand what you are hoping to accomplish, your expectations and/or the deliverables. 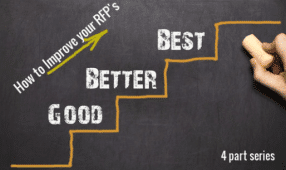 If you are new to the RFP world think twice before you issue a RFP for a $10,000 job if it is going to cost your vendors $2,500 to respond to it. There is not enough money in it to warrant their effort. It will fail, become a lesson in frustration and be a poor use of your time. If you are not prepared to issue clarifications or answer Vendor questions during the RFP response process, then do not issue it. If the user group does not clearly define the need (deliverables) then simply do not issue it. 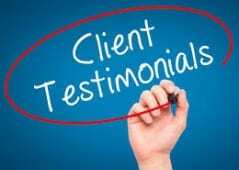 If they are not willing to invest the time to give you a solid scope do you think it is going to be clear enough for the vendor to provide a quality response or even worse they might build in an extra 20% to cover the unknowns. So, in essence you could be paying more than if you went with your usual supplier and dedicated this time to meetings and negotiation. Some purchasing professionals might roast me for the above comments, yet, having been someone that has had to field questions, set up appointments with user groups to gain clarity and try to develop a matrix to determine an award, we understand first hand how frustrating it can be. If your goal is to succeed, then it is best to put the effort into the document upfront. Let us help – check out our forms HERE.